This is the Lincoln county buck Ronnie took. Have you ever decided to sleep in when you were going deer hunting? For one reason or another you decided to stay in the bed ,and not get after those big bucks. We’ve all been there and done that. Maybe the weather was bad, or you just needed some sleep. When that alarm goes off sometimes it’s just hard to get out of that nice warm bed. Even if that’s the case there is still hope of getting that trophy buck. 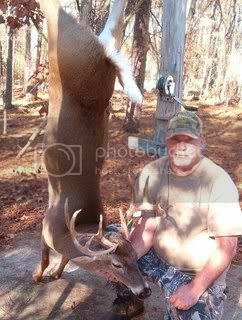 Such was the case the last week of the 2007 deer season and this Lincoln county buck in Georgia. It was rainy and foggy Monday morning when the alarm woke my father-in-law Bill and his nephew Ronnie. They were deer hunting at there hunting and fishing camp. They decided to sleep in. When they woke up around 7:30 the rain had stopped. It was time to go hunting. They were hoping to see some big bucks. Bill decided to go to a stand on a food plot on the same side of the road as the camp. Ronnie decided to go across the road from the camp, to a stand on a hardwood ridge with some planted pines behind it. Bill got in the stand around 8:00am. He hadn’t been there long at all when he heard Ronnie shoot. Ronnie had just got up in his stand when he heard something behind him to the right. He turned to see a really big buck running. He bleated with his mouth(quick thinking)and the deer stopped. He put his rifle up and aimed and squeezed the trigger on the big Lincoln county buck. But the safety was on, when he flipped it off the big buck took off again, Ronnie bleated again and the deer stopped in a small opening, Ronnie aimed and didn’t miss. The big deer dropped, Ronnie had just taken his biggest buck ever. It was a short but sweet hunt. Bill helped him get the big brute out. This goes to show you if you get up late it’s not to late to get a big buck. Who knows you might get your biggest buck ever. Big deer Rosco bucks feeding habits. Now that winter is upon us and deer season is over in most areas. The whitetails are relying on a lot of our food plots as there main food source. Learning bucks feeding habits and different foods can be helpful in finding whitetails or better yet big bucks. Have you ever been deer hunting one week and there was a lot of deer sign in a particular area? Only to discover the next weekend the deer sign had disappeared. Was it do to hunting pressure? Or could it have been the food source diminished in that particular area? That’s one thing I like about deer hunting. The challenge of figuring out what the whitetails are eating at different times of the year. The foods and feeding habits can change from season to season or one place to another. If your deer hunting property doesn’t have many food sources on it you may not see that big buck. Deer eat anywhere from five to eight pounds of food every day per one hundred pounds of body weight. During the winter up to December does and fawns are gaining weight. While the big bucks are trying to maintain there weight. During the rut big bucks don’t eat much. They have something else on there minds. Not to say you won’t harvest one on a food plot. He may eat a little, but he’s there because the does are. Whitetails throughout the southern, eastern and central regions of the United States eat fruits, acorns, pecans, hickory nuts, and berries. They love the white oak acorns the best. They also like herbaceous plants. And grasses legumes ferns, and asters. They like leaves and flowers also. When times get tough in the winter they turn to woody stems and twigs. Mushrooms are important to the deer in the winter. Farm crops and food plots are really important after the acorns are gone. Deer love corn, oats wheat, peas, soybeans, alfalfa, clover, apples, and rye. These are just a few of the foods deer have in there diet. They are able to adapt well to the food sources in many different regions. Getting to know your food sources in you area can help you when hunting season rolls around next year. 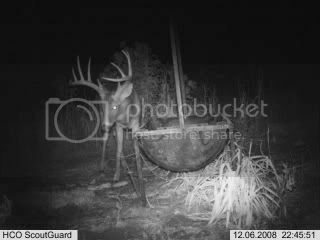 Big Buck Rosco visiting feeder in Jasper county in Georgia.